You hate huge navigating boards in airports? You easily get lost in those ridiculously large malls? You always wished to have something like Google Maps for inside? A Viennese startup is making our lives easier, helping us to not get lost indoors. Indoo.rs basically is Google Maps for inside buildings. The startup developed software that can be used as the basis for any indoor navigation application. They work with the building’s WIFI infrastructure and beacons. Their most famous project is the work they did for the airport in San Francisco. After having won a competition where the city of San Francisco gave startups the possibility to participate in the city’s development indoo.rs was tasked with developing a navigation system for blind and visually impaired passengers. The team worked for three months to set up and install the system with 300 iBeacons on 60.000m2. At the beginning of each project the team has to create a map of the building. At the site indoo.rs installs the hardware. The beacons are put in different strategic locations around the area and send signals via Bluetooth 4.0 and indoo.rs’ patented algorithm enables accurate positioning within the building. Projects that the team of indoo.rs is working on include further airports, train stations, museums, trade show halls, shopping centers and large office buildings. The benefits for the users are evident: you can find your way fast and efficiently inside complex and large buildings. The location itself has the benefit of being able to track the visitors or passengers. This allows a detailed analysis where people tend to go, where they spend time and which locations they avoid and can be used to tailor location-based marketing measures and strategic decisions. And who is behind it? 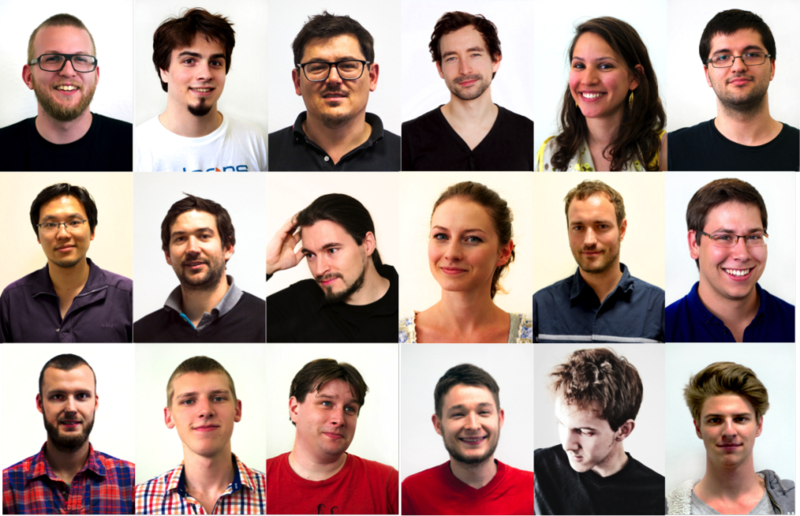 The indoo.rs team consists of 18 persons. 10 of them work as developers, 4 exclusively focus on cutting-edge research and 4 are responsible for the startups business side. Indoo.rs was founded by Bernd Gruber, coming from a business background and Markus Krainz, who brought in the necessary technological know-how. At the beginning of this year the team hired the experienced CEO, Hannes Stiebitzhofer. The indoo.rs Vienna office is located in the Frequentis startup center and as the startup is growing rapidly the team is setting up a new branch in San Francisco. Co-Founder Bernd spent several hours at the airport in Düsseldorf when he was waiting for a connecting flight in 2010. Shortly before that there was a fire at the airport which left some parts a bit chaotic. Bernd could neither find a toilet nor a restaurant and was thinking how great it would be if he could just use his smartphone to navigate through the airport instead of spending too much time in front of those huge ugly boards that make you feel more lost than before you looked at them. He explained his idea to co-founder Markus who agreed to develop the software. After two years and many iterations the two founded indoo.rs in 2012. Since that the startup is growing steadily. During the last months the team has done a lot of demonstrations, testing and fine-tuning. At the moment the startup is concentrating on the markets of Central and Western Europe as well as North America. But they are expanding: first projects have been secured in the Gulf region, South Africa and Australia. At the beginning FFF (family, friends and fools) contributed money to make indoo.rs possible. Both founders also invested a substantial amount of their savings into their project. In the beginning of 2013 the startup could secure funding from Inits and ZiT. On a European level the team is cooperating with Horizont 2020 on research projects. “Besides being a software start-up you could say we are a research center.”, Florian explains. Since about one year indoo.rs has secured its financing. The vision is to enable indoor-navigation on all mobile devices. The team is working on a solution to simplify and automate the process of mapping and make it as user-friendly as possible. Maps still have to be created by hand, to be subsequently put into the indoo.rs system. In theory this solution could mean that entire cities could be mapped within a few short weeks. This is an important prerequisite for the scalability of the start-up’s solution.